A Verdant Touch Of Finland At ..
Busan is a dreamy coastal city in the southeastern end of South Korea, about 200 miles from Seoul. It’s a lovely place that feels slightly less cosmopolitan than Seoul but is filled with beautiful beaches, fresh seafood restaurants, modern art museums and galleries, and of course, plenty of specialty coffee shops. What struck me most about the cafes in South Korea is that so many of them were brand new; many of them had barely been open a few months, or even a few weeks, when I visited this past fall. The scene appears to be growing rapidly, and I can only imagine how many more places there will be to add to this list in a year’s time. Here are just a handful of shops worthy of visiting in Busan. 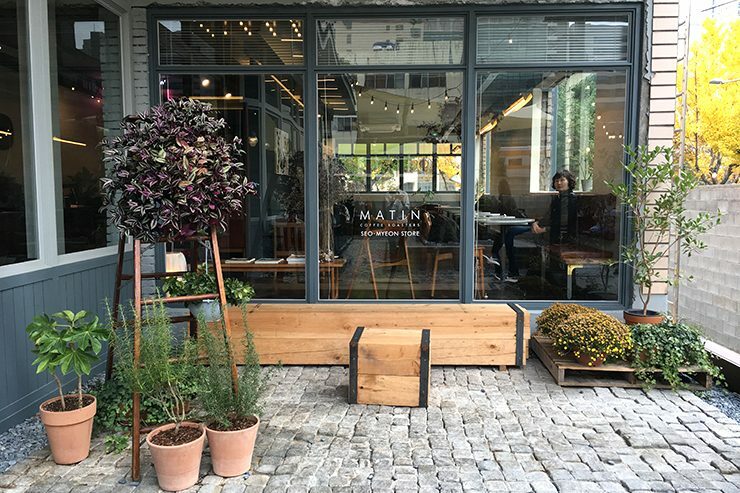 Cat people and design enthusiasts will appreciate Matin Coffee Roasters, a stunning new cafe and roastery in Busan’s hip Seomyeon neighborhood. The large space is outfitted with beautiful vintage Scandinavian furniture, and the company’s branding and coffee bags star an illustrated cat. “I’ve always liked cats, and I guess I just wanted to add a unique and playful element to the cafe,” owner Jihyun Oh explained. “Specifically I have a deep interest in caring for street cats, and I wanted to tie that into the cafe somehow, so we donate a portion of our sales each month to a local animal shelter.” Although the concept is a bit sweet and gimmicky (even for me), it’s executed tastefully enough. In addition to house-roasted coffee, there is an impressive offering of homemade sweet treats (Jihyun Oh also owns a bakery, located around the corner from Matin), and the courtyard and garden area outside is ideal for the stylish young clientele to see and be seen. Matin Coffee Roasters is located at 2F, 49 Dongcheon-ro, Busanjin-gu. Follow them on Instagram. Hidden in a quiet alleyway in the middle of Busan’s hectic Seomyeon neighborhood, you’d never encounter this modest coffee shop unless you were looking for it. Dennis Oh, the soft-spoken fellow who runs it, intended the cafe to serve as a gathering place for creative people in the neighborhood. Guests can choose espresso drinks or filter coffees from a selection of beans from Seoul’s Felt, and there’s always something pleasant and upbeat playing on the record player. Oh himself seems to be behind the bar most days, and if you feel like striking up a conversation with him, he’ll happily chat with you about coffee, design, and Sydney, where he once lived working as a barista. Cafe Dennis is located at 36 Jeonpo-daero 306 Beon-gil. Follow them on Facebook. Motto Coffee is a gem of a shop in busy Mangmi-dong. It’s housed in a brick building with a large parking lot, giving the exterior a strip mall-like vibe that feels somewhat incongruous to its cute, plant-filled interior. The menu is pretty limited, and while they don’t offer filter coffee, the almost extreme simplicity of this shop is what gives it its charm. The open, airy space gets incredible natural light, and it’s a really lovely spot for getting some work done or reading a book. Motto Coffee is located at 16, Gwajeong-ro, Suyeong-gu. Follow them on Instagram. RBH Coffee is one of Busan’s slightly more established roasting companies. With a roastery in Haeundae and a coffee bar in Oncheonjang, RBH plays an active role in Busan’s growing coffee community, offering barista classes and coffee seminars, and providing wholesale coffee to many cafes around the city. 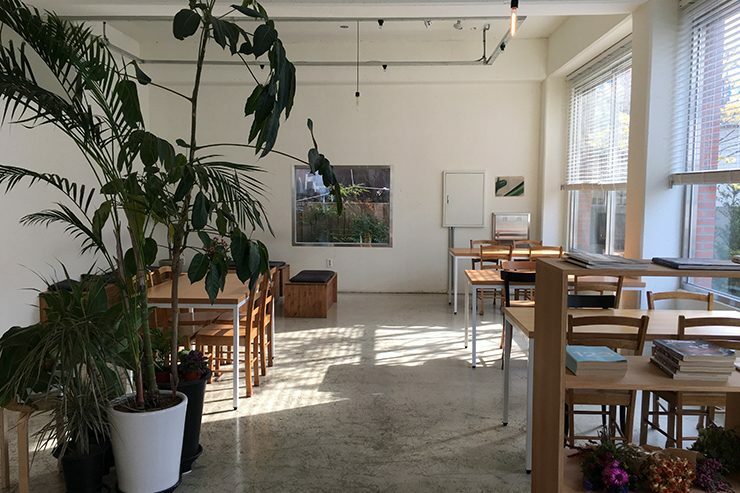 Although there has always been an abundance of cafes in Oncheonjang, owner Kyunghun Park wanted to open a true neighborhood cafe serving high-quality coffee catering to younger people in their 20s and 30s. The shop is clean, simple, and modern, with lots of seating and a nice array of design magazines to flip through. Oncheon Stream Park, a lovely place to visit in the spring and summer, is located nearby. RBH Coffee is located at 1F, 22-1, Osige-ro, Geunmjeong-gu. Visit their official website and follow them on Facebook and Instagram.